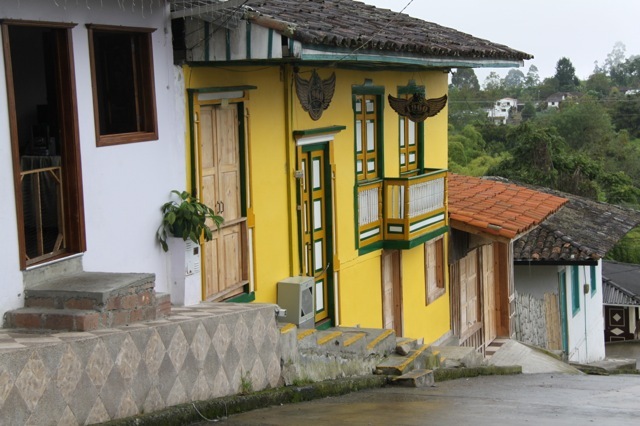 Salento is a picturesque villages in the heart of Colombia’s coffee triangle with steep narrow streets, multi-coloured wooden houses with brightly decorated balconies, and a wide square dominated by a statue of Simon de Bolivar. Little has changed here for decades. Like all the villages in the surrounding area live because of the coffee industry. This is where the locals gather to eat, drink and relax and it is peppered with small bars and cafes. 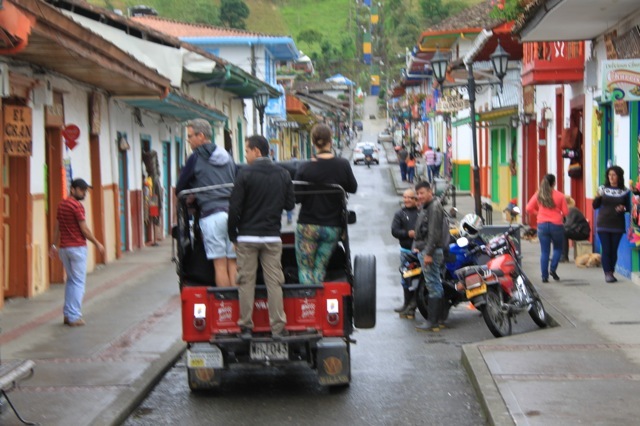 From the village square we are taking a Willy Jeep ride up into the awesome Corcora Valley. The Willy, a robust gleaming 4WD that infiltrated the area shortly after WW2, drips with gleaming chrome and history, and has long been the traditional means of transport for locals to get around. Functionality rules over comfort and it’s not unusual to see one with people literally hanging off the sides. 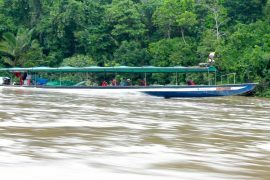 As we drive higher and higher into Valley the mist descends leaving the famous wax palms, some more than 60metres tall, thrusting skywards. 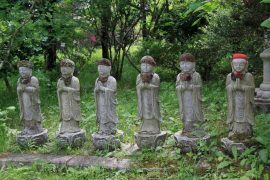 It is an unforgettable vista of ghostly apparitions. These trees are the same variety as the indigenous Colombian tribes used as part of the process of turning raw gold into exquisitely intricate jewellery and can take up to 100 years to reach their full maturity. 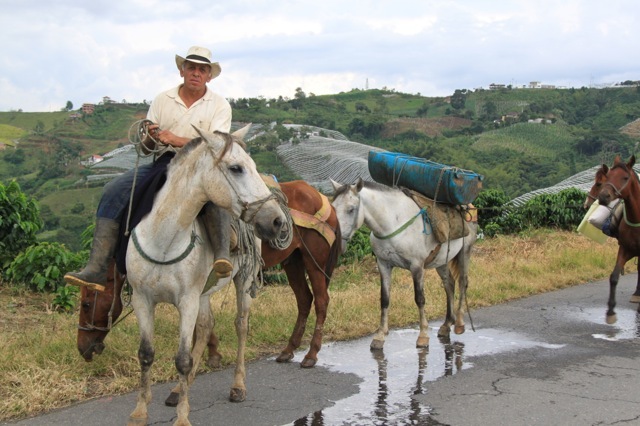 Waiting for us, after our lunch of locally caught river trout, is Fidel Torres who has spent most of his life as an arriero (mule driver) crisscrossing the hillsides on narrow tracks for days, picking up and delivering the coffee from the more remote fincas. Now he is an “ecological guardian” helping with the conservation program to preserve those palms still left and replant in the places where there has been serious over-logging. This is a beautiful area to explore on foot or by horse. A forest broken only by the occasional path and small, wild river, tumbling over rocks into pools that harbor mountain trout; the eerie stillness occasionally echoing to the sounds of the forest wildlife. It is a blanket in shades and shapes of green shattered by a whirl of colour as little birds dart and dive. If you have the legs and lungs for it there are also a number of heart-in-your-mouth mountain bike runs. It’s definitely worth allocating several days in the Coffee Triangle as there is plenty to see and experience and the people are warm and welcoming. At night the small villages come alive and the sound of salsa flows from the bars and restaurants as locals hang out. Café Jesus Martin is also leading the fight for quality coffee. Pop in for a great cup and to discuss the national obsession of long-distance cycling.